AFAIK, the American Spirit was a true garage build, based on as many existing components as possible. As a tactical joker for Reno, the design team insisted on retaining the T-2's air brakes, hence the slightly odd rear fuselage: the plan was to use the brakes during the start procedure, when the engine could be revved up to full power but the air speed still controlled manually. This was supposed to yield a 4-5 sec. leap against typical racing Mustangs and still 1-2 sec. against the intended main foe, "Rare Bear"! The prop is intimidating - and apparently this design, with few but deep blades, seems to be the latest trend. I have seen this on a Bearcat, too. No plastic has been cut yet, but I delved through the donor bank. 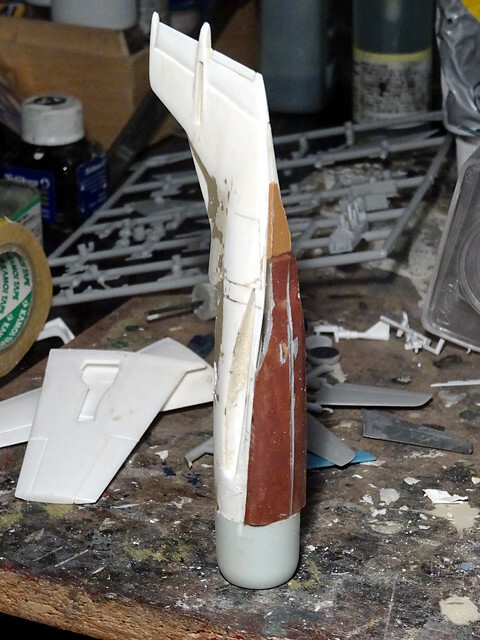 Found the base T-2, as well as an F-100 earmarked for slashing. 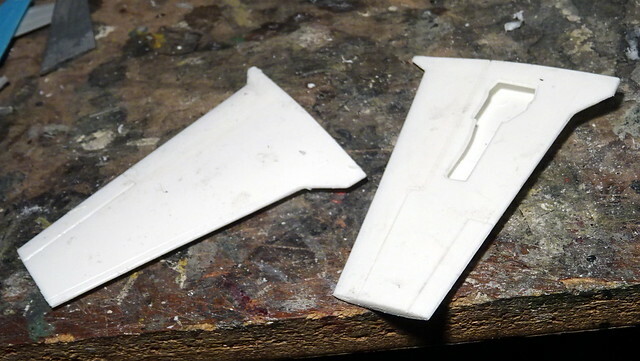 Found a pair of F-86 stabilizers, too, as well as resin DC 7 cowlings, P-3 blades and C-130 spinners! The canopy is still a challenge, but I am amazed how much suitable material I actually had at hand?! No idea concerning the livery yet. I somewhat favor a very simple scheme, all white or silver, or something blatantly "patriotic", matching the aircraft' name. AFAIK, Cornell had been searching for a sponsor, but I am not certain if I actually want to follow that design route, after the Gulf Mustang. The XF-84H Thunderprop had a similar design, and it was meant to spin supersonically. Were these piston engined designs mean to spin that fast too? Were these piston engined designs mean to spin that fast too? Not if it's to be a Reno Racer, the public are very close to the race line (been there, done that) and the racket from a supersonic prop couldn't be tolerated. If by what I saw at the races back in 96 or 97, they turn slowly and for myself I could hear the throb of the props long before they appeared at the finish line (they go down into a valley as they turn around at the last pylon to head to the finish line and disappear from view). Rare Bear was the first I think to fly with one of these very wide chord bladed props. Ah, I can clarify the confusion: I mixed up two projects of the same designer (Dave Cornell), who created the "Shockwave" for Darryl Greenamyer, but ALSO built a very similar aircraft in the mid Nineties on his own agenda, the "American Spirit". The XF-84H Thunderprop had a similar design, and it was meant to spin supersonically. Apparently the sound waves made people physically sick. Which got it the nickname of the Thunderscreach. 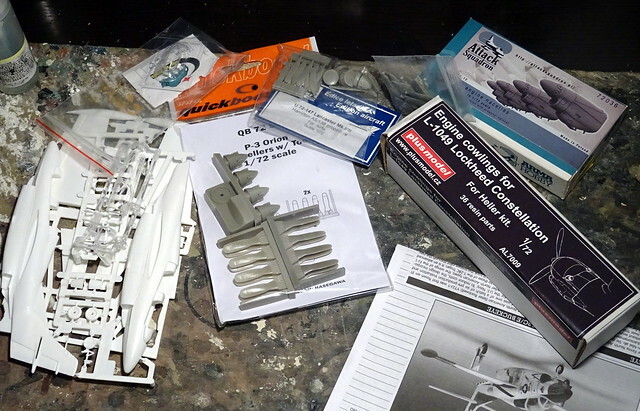 I've got the X-Planes vacform kit in The Loft. I have NO idea why I haven't built it yet, it's just crying to be Whiffed into an in-service version. Maybe Canadian, eh? No news here so far yet, due to health issues since last weekend. Indeed, hope everything's ok Dizzy ? Allergy shock last weekend (again...). But I am O.K., and actually I started work on this one yesterday evening. The T-2 lost its nose, engine bay and the original cockpit hump, and I made a new opening for the new cockpit right in front of the fin. I also found a nice canopy - hard to identify, looks almost as if it came from a Ho 229. The wings also lost their tip tanks and the flaps (since the American Spirit would not feature this luxury, as well as any trim tabs). 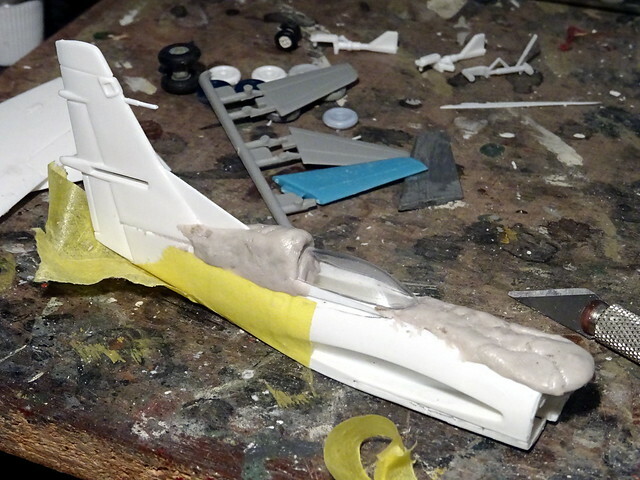 This will become messy, I think, and I will work my way from the rear/cockpit forward to the engine and finally see how I can rebuild the lower fuselage. The thing is looking cool and fast, though, and it is large. A Mustang looks rather diminuitive next to it, and it's still missing the engine! Due to the circumstances, slow but somewhat steady progress. 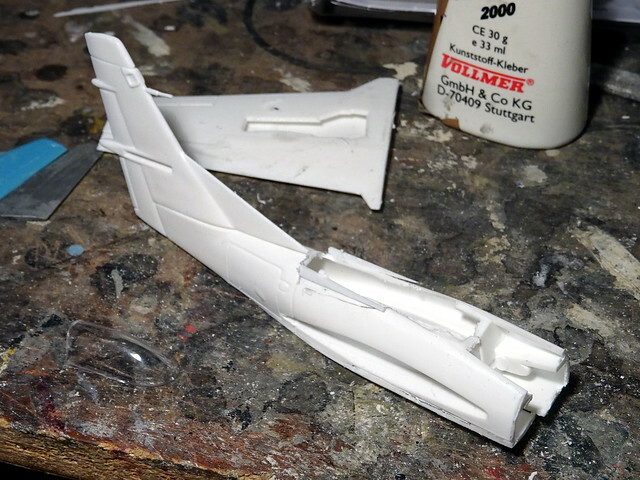 For the engine I eventually switched to a Centaurus cowling from the Pioneer2/Airfix kit, which is IMHO a little narrow, but the diameter is an almost prefect match for the T-2 fuselage. 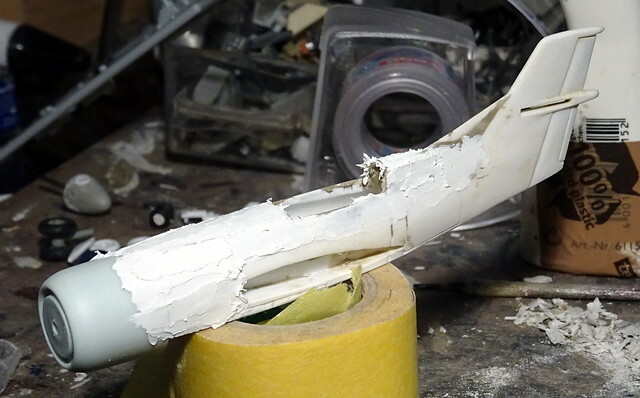 Work on the propeller has also begun; I used an authentic C-130 spinner, which had to be cut off of a massive resin nacelle that came with an integral spinner... The donor part received a metal axis and a sytrene tube adapter in/behind the Centauris engine, and three of the six propeller attachment points on the spinner were faired over. 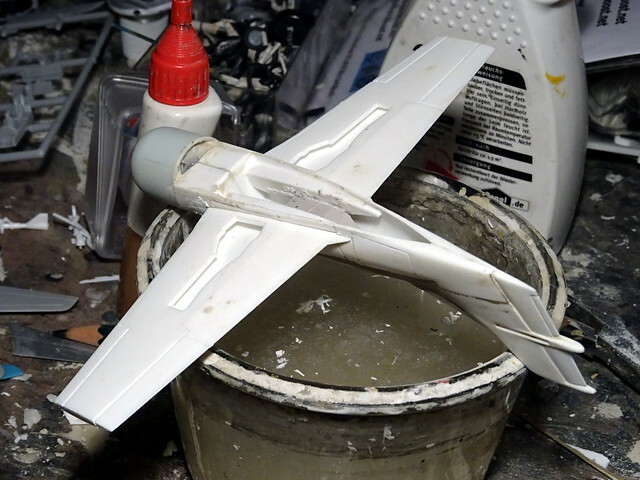 They go together really well, but firther work (the monster blades from a P-3, which come close to the original Aurora parts) will resume when most of the fuselage has been finished. The canopy and the respective fairing with the (now clipped) fin turns out to be a 3D sculpting nightmare, but it's slowling coming together. 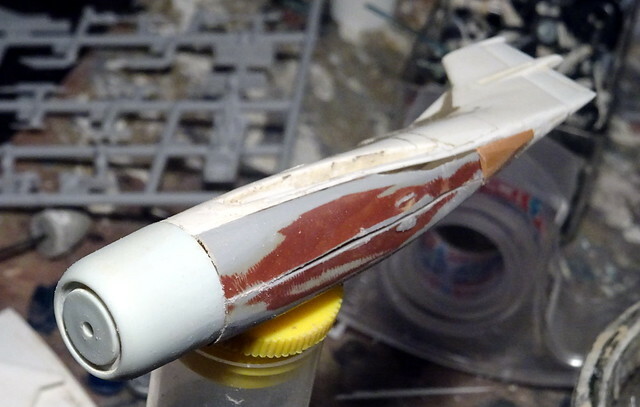 I also installed a cockpit tub now - a leftover floor/back firewall from a Revell Fiat G.91, trimmed down to fit between the wing attachment fairings which bulge inside. 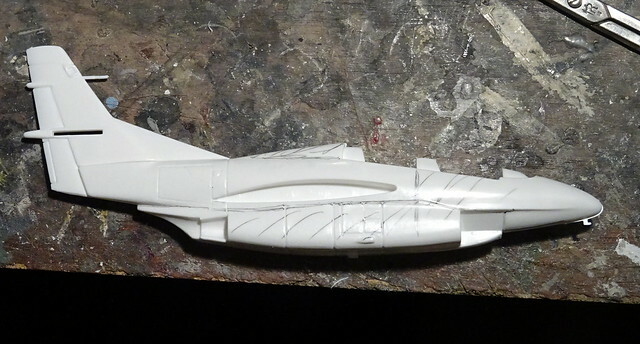 After the engine (filled with tons of lead) has been fitted I now turned attention to the lower fuselage, which has to be completely improvised. 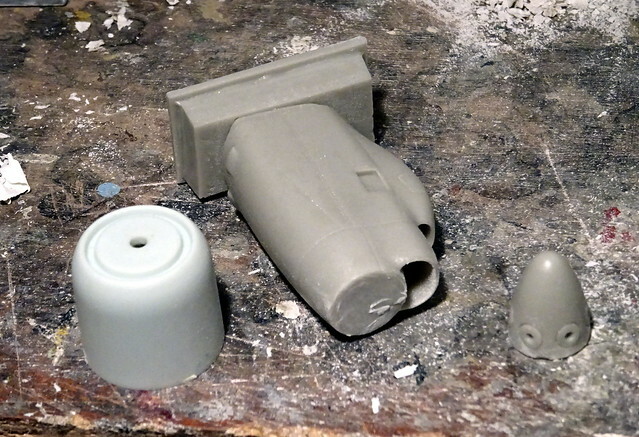 I found a leftover rear end of a ship hull in the donor bank, and with some trimming in any dimension it is, together with a simple styrene sheet wegde at the rear, a good basis for further body work with putty. The wings have also been further modified - the T-2's small LERXs are gone, instead I gave the aircraft some air scoops in the wing roots - no picture of the American Spirit shows any air intake, what I find dubious? This thing looks SO odd, with its high and swept tail and the deep but thin T-2 wings! And I think it will get even stranger when the wide and tall tricycle landing gear is eventually added!? 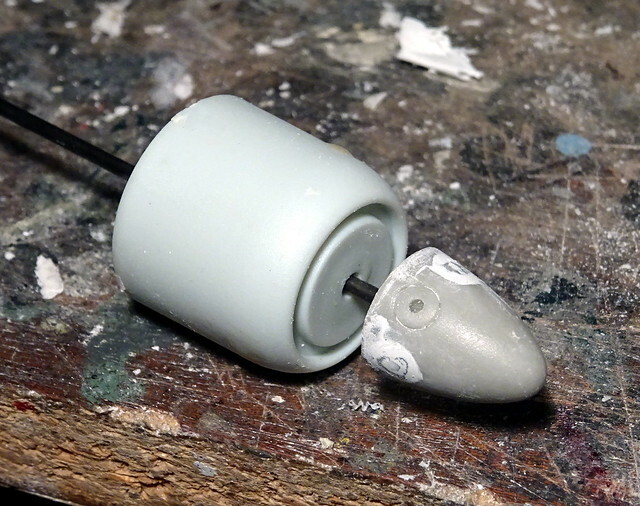 Pics added to former WiP posts.